Tiffany Yong: Following the core values of Sha Po Lang, PARADOX, the third installment of the series discusses the value of lives, the changes in the relationships between human, and how they are linked together. We often talked about how the world is small, and I loved how the director expresses the interweaving intrinsic relationships within characters in the most amazing way (To avoid spoilers, think cars at crossroads). This film was full of surprises! The plot was conventional, but rather unpredictable. Leading you through act 1 with an expectation of a cliched story, and then turning on it’s heel and heading in the other way. Tiffany Yong: We all get to see familiar faces, but I was really impressed with how each actor had managed to surpass their previous works and create a deep impression in the film. In case you are wondering, Tony Jaa who starred in the previous SPL2 as a Thai prison guard, cameoed in the film, this time as a police, so they are two different characters. There were many films who throw big names in for the sake of the box office, but screenwriters actually managed to give him a brief but pivotal role in the plot. His exit managed to trigger emotions strong enough to motivate the characters to act in ways that drives the plot towards the climax. Tiffany Yong: I am not unfamiliar with Wu Yue as a China actor. His past roles might have been good, but forgettable. If Ip Man was Donnie Yen’s representation piece of work, PARADOX could easily be Wu Yue’s. His character as a Thai-Chinese detective, Chui Kit, seemed like a typical heroic protagonist initially, but the little surprises that came along the way made me wish that he could have more screen-time than Louis Koo. Of course, this would not have been possible with the (successfully) detestable Sacha (Chris Collins) as the swag and inhumane organ-trafficker. Peps Goh: The action sequences too were unexpectedly stunning, with the choreographer and his team going out of their way to be impressive. Their application of really complex wire-work, that well balances the need to remain believable while being totally “WOW”, to garnish an already great fight sequences with epic moments are really applaudable. This is the third installment of the Sha Po Lang series. The production took more than 3 months, and it was filmed in Bangkok, Pattaya as well as Hong Kong. This is Hanna Chan’s acting debut, as Louis Koo’s 15 year old rebellious daughter. She is also a model. It is Louis Koo’s first attempt at a proper action flick. In the previous SPL II: A Time for Consequences (2015), he was a sickly evil man, but this time, he turned into a Hong Kong police who’s also a loving dad. It is Gordon Lam’s first time acting a role with 95% of the lines in Thai. His greatest challenge came when the director request to change the lines on set, as he would have to relearn and digest every line again, making it sound like a Thai. All the veteran martial arts actors, including Tony Jaa, Wu Yue and Chris Collins were all trained by action choreographer Sammo Hung. Tony Jaa, who is known for his fast kicks, showcased his 360 degree single-leg jump kick in the film. Singaporean actress, Michelle Saram, was invited to cameo as Louis Koo’s deceased wife after Louis Koo caught a replay of 2000’s “At the Threshold of an Era II” (创世纪 Ⅱ 天地有情) on TV where she acted alongside with him. Check out PARADOX (杀破狼·贪狼) Facebook Page! 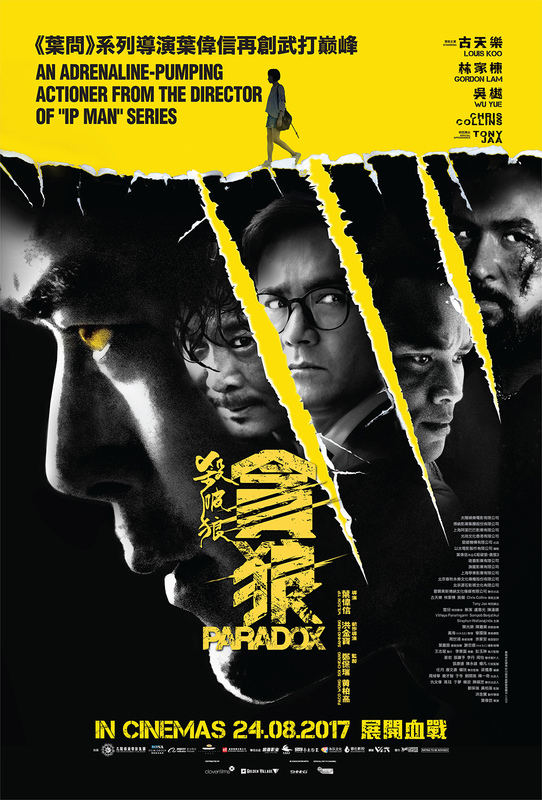 PARADOX (杀破狼·贪狼) is out in cinemas on 24 August 2017. Saw many familiar faces, I have not watch this movie yet. From your review maybe I watch it this weekend. Trailer looks promising. I should try to watch this if ever It comes to my place. Sounds like an edge-of-the-seat crime thriller! Reminds me of Taken! I hope I can watch it! Looks very action packed and full of thrilling twists and turns! Thanx for the great review, I am now hoping it will come our way. I have a very special place for movies and actors from the east. It looks like a good movie to watch to follow the story of unlocking the culprit and a higher power that pulls the string. This can really get you hooked on the story. Your review made me very interested to catch this film. The rating is so high. Mentioning “Ip Man” in the poster really sparked my interest a lot! Hope they show it here.